Kerala is very popular for its payasams. Payasam is a sweetened milk/coconut milk based dish. This traditional dessert is served post meal during festivals like Onam & Vishu and also other festivities like weddings, naming ceremony and so on. There are a huge variety of payasams that people make for different occasions. 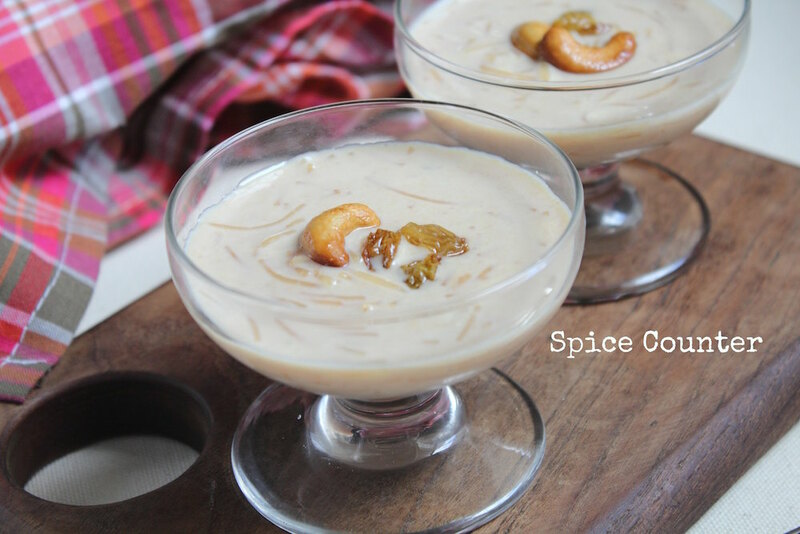 The simplest of them all and the most popular one is semiya payasam or vermicelli payasam. Vermicelli is cooked in milk, sweetened and then flavoured with cardamom. I have added a bit of caramelised sugar since i like the flavour. You can avoid by replacing caramelised sugar with regular sugar. However don’t mistake this method for caramelisation of milk that is done to which lends a light rose brown colour to the milk. That is a more time consuming process. Semiya Payasam or Vermicelli Payasam is the Simplest and most popular of Payasams! Add vermicelli to the boiled milk and cook it till done. It takes about 15-20 minutes to cook it on low to medium heat. In a separate pan add 2 tablespoons of sugar and 1 tablespoon of water. Heat the sugar mixture till it caramelises and turns light brown. Add the caramelised sugar and 2 tablespoons of regular sugar and cardamom powder to the payasam. Heat ghee (clarified butter) in a pan. Fry the cashews and raisins separately till golden brown. 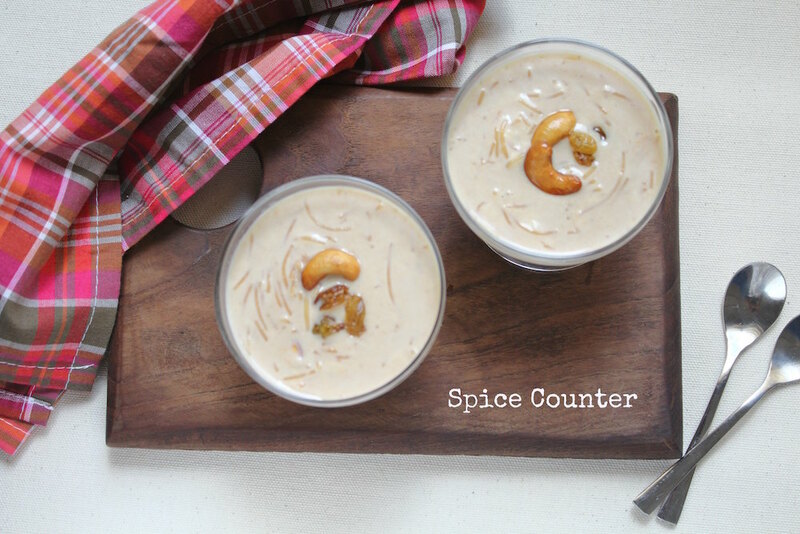 Garnish the payasam with the cashews and raisins. Do not let the caramel become dark brown since it will lend a bitter taste to the payasam. You can skip the caramelisation of sugar and just add regular sugar instead.